Hard to care for a character that you don’t know well enough or the in-game cast ignore the passing of. 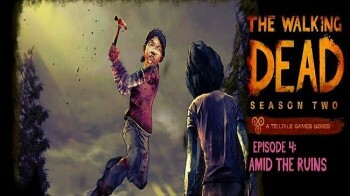 The Walking Dead: Amid the Ruins brings us the penultimate episode in Season 2 of Tell-tale’s masterful character driven adventure title. Will it avoid the water-treading and procrastination of other episode 4’s in Telltale’s episodic franchises? 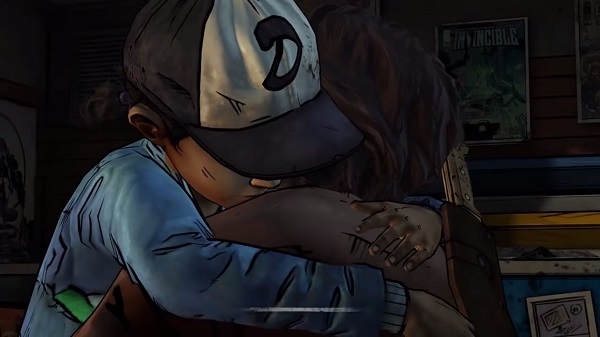 Things have been pretty rough since losing Lee for Clementine. The world and its non-zombie inhabitants are mostly to do with that. Sure the Walkers are a pain but you can predict their behaviour to some extent – it’s the humans that’ll surprise you. Fresh from the compound where they’d been held captive. 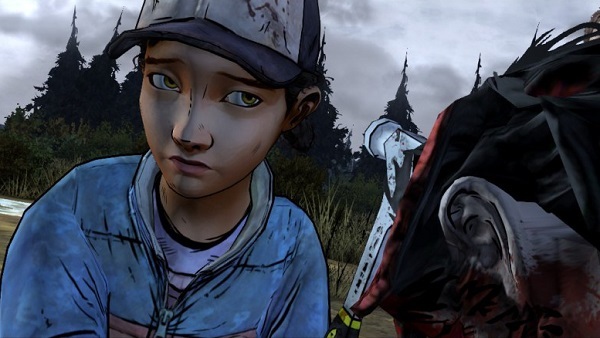 Clementine and her group make their way to freedom through a field of zombies. Safely proceeding by smearing themselves in the “juices” of the fallen corpses lying around. This is where we left things at the end of the last episode and it’s still as tense a situation as it was then. In Amid the Ruins the group are trying to gather themselves after the brutal escape. A recent bereavement leaves a character skirting the edges of taking their own life whilst whilst another is fighting to bring new life in to the world. The juxtaposition is not wasted on the viewer/player but it’s more than a little ham-fisted in it execution. And that, to be honest, sums up the meat of Episode 4 – a little ham-fisted. The usual rich character development and storytelling is scatterlogical at best. Characters seem to able through the scenes with little to no motivation. Key players you’ve known for an episode or 2 (or more!) are snatched from you and nobody around you seems to give a damn – so why should you? 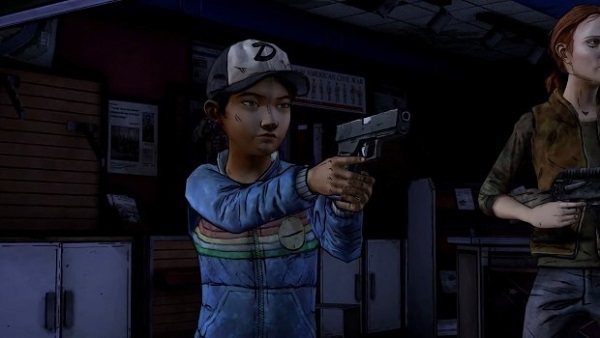 The tension that surrounds Kenny and his interactions with Clementine shine through as the centrepiece of this episode. At least they do for about an hour of the 1hr 40min run time as later events happen that seem to snap things back to the usual “run & survive” mentality. Which is all well and good but you’d have thought these things would have surfaced again when things settled down more. Characters just don’t seem to be acting as they “should” based on who they’ve been and who you know them as. People that seemed to be developing throughout the past episodes just seem to start performing acts randomly and it just feels wrong. Then, just as you think it can’t get any weirder, some new characters turn up and it feels almost like a cartoonish parody of the series. Technically there isn’t any real issue with Amid the Ruins. The game runs well enough with only a minor sound glitch (I could hear the zombies trashing stuff at the compound whilst walking through the forest minutes later). Character animation and realisation is still top notch, although these new characters seem a little out of place with the rest of the world. Voice work is solid if a little “phoned-in” in places. That said the holes in the script where motivation and development should have been can’t have helped the voice actors in their plight. 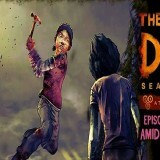 The Walking Dead: Amid the Ruins is a stumble along the path to greatness I’m confident. Given the performance of Telltale to date you have to give them the benefit of the doubt here. There’s nothing fundamentally broken, it’s just not up to the very high standard we’ve come to expect in previous episodes. 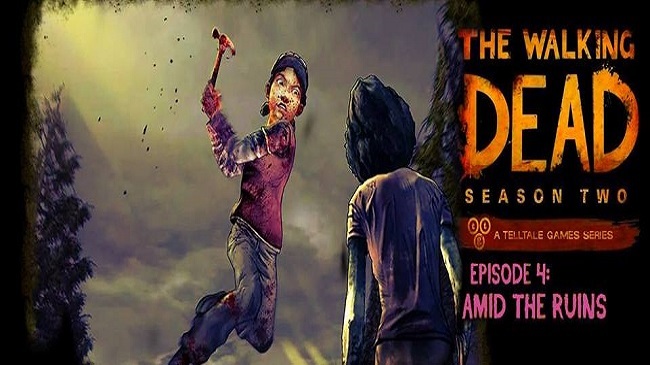 Amid the Ruins then is easily the weakest part of the Season to date with strange character motivations, missing character motivations, comical new antagonists, characters behaving out of.. well character and a lack of any real forward development. You’ll play it, and you’ll enjoy it well enough. Yet it won’t really build up any incentive for episode 5 and it won’t feel like you’ve achieve much other than lose characters you previously cared about in some very cheap ways.